Off to a great start. Arrived in Kerikeri yesterday to fantastic weather and getting prepared today. Staying at the Hone Keke Lodge and shared a room with another Te Araroa tramper last night, who started at Cape Reinga about 10 days ago and is continuing on today. For me, today is all about getting the final preparations complete. 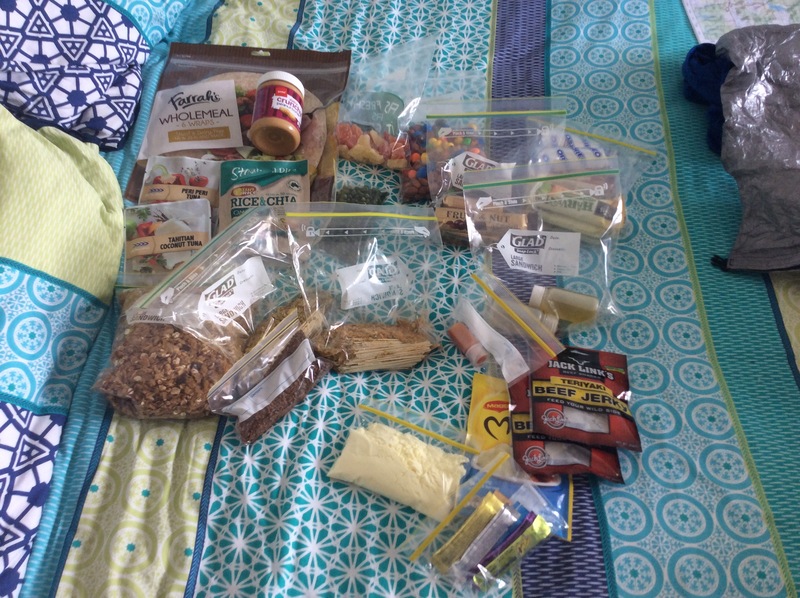 Unpacking and repacking after flights – all of the gear that will be carried on the outside of my pack was squeezed inside to ensure nothing went missing in transit; getting SIM cards for my ipad and mobile; and heading to the supermarket to get my first supply for the trail. I travel to Kaitaia tomorrow then head north to Cape Reinga to kick off on Wed.
Fours days of food in photo below. I forgot how good the dried fruit, lolly and nut section of New World is over here. Weigh out as much as you want and huge selection. Nice dried paw paw, papaya and pineapple will be delicious. Mick, met you at the start of your journey today. Took a photo for you to start your journey. I wish you all the best. Shane Meloncelli. Thanks Shane! So far so good. Have made it down 90 mile beach to Ahipara and looking good. Great planning always pays off ‘Boris’ (do I really have to call you Boris, its hard enough for me to call you Mick) anyway, fantastic start to another adventure. Gooooooooooo and enjoy! Thanks Maggie. No need to call me anthing other than son.